We are a part of God’s family – a community of believers. And while our Sunday gatherings are key moments together in church life – we can’t ‘live’ there. That’s why we believe that small groups are central to the life of the church. And the more our Hope Church family grows the more important they become. Our vision for our Hope Church community is to be a place where everyone who comes into the church can find a ‘home’ in a group where they can flourish, whatever their background. Our existing Community Groups seek to be places where we are known and can know others, share our lives, care for each other, and work out our faith together in practical ways and they have served us well for a long time. But now, as God continues to bless us with an increasingly diverse congregation, and as changes in our world impact all our lifestyles, there is a need to expand our view of how we do small groups. You may have noticed that we have already ‘modelled’ some different types of group, based around an interest or passion. For example, in the last year we have had groups based on Bible Journalling, British Sign Language, Theology Discussion and a Book Club, all of which have gone well. So now, during October and November 2018, we are going to invite everyone to ‘sign-up’ for a small group that you will be able to choose from, what will hopefully be, an extensive menu! Some groups will be specifically ‘spiritual’ e.g. deeper Bible Study, exploring life in the church, developing your spiritual gifts; some will be based around a life stage e.g. parenting, and some will be more activity or interest based e.g. from patchwork to pub walks. As you can tell we already have some ideas – but we are looking for lots more. So are we getting rid of our Community Groups? Definitely not! We are just pressing the ‘Pause’ button. Our existing Community Groups have served us so well over many years and continue to work well for many in the church. They will carry on long term. However for October and November you are invited to step out of your group and try something new. If that’s really not for you then your group leaders will help you to make alternative arrangements for this short season, after which your group will continue as normal. Are we just following a fashion or fad? It’s true that many churches like ours, and some from different backgrounds, are exploring new ways of meeting in small groups. But, like us, they are simply seeking to respond to the need to find authentic expressions of community life in 21st century Britain. And the good news is that we can learn from others who have gone ahead! Are we going to become a social club? While a short term sign-up group cannot realistically cover all of these, it will cover one or, hopefully, two. For instance, an interest group could gather people from the church who would not normally see each other (In) and be an easy place to invite friends, neighbours or work colleagues who are not yet Christians to develop our friendships further (Out). 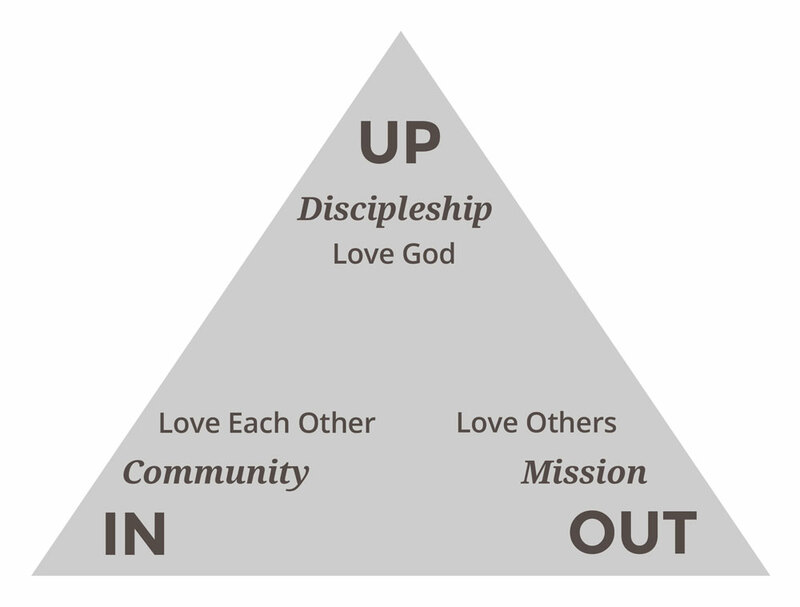 In another example, a deeper bible study group will encourage us both in our relationship with God (Up) and most probably help make new friendships within the church (In). So our new groups will intentionally carry the DNA of Hope Church, even though the expressions may be different to what we are used to. There’s no need to do anything about signing up for a group just now – but I would like you to consider whether you might host a group. Over the summer I will be talking to any potential group hosts and putting our ‘menu’ together. If you are interested in hosting a group around your gifts, interests or passions, hobbies or occupation, then please come and talk to me – I’d love to hear from you! Download our ‘QUESTIONS FOR POTENTIAL GROUP HOSTS‘ here to pursue this further. The menu of groups on offer will be circulated at the end of the summer to whet your appetite for a ‘Sign-Up Sunday’ on 9th September. After the service we will set up a ‘market place’ where you can talk to group hosts and sign-up. Don’t worry if you’re not around that day – there will be other opportunities to join in! I hope you will join us and play your part on this journey to explore new ways for God’s life to be made real among us!